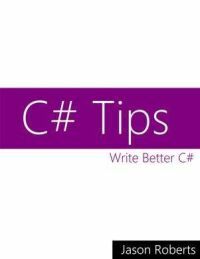 After first hearing about C# Tips by Jason Roberts in a tweet less than a month ago, I decided to buy it and see whether the author can really contribute to writing better C# as he promises on the book's web page. After reading it, I can agree. As the title says, most of the book is dedicated to short tips and tricks on how to make the most of the language and improve your code. Currently there are 21 tips in the book and based on your previous experience you might already know about some of them. Still, I'm pretty sure, you're going to learn at least something new. I must say, I wasn't aware of all the nuances described in the book, although I've been using C# on almost daily bases since it was first released. And even for things you already know, it's sometimes good to be reminded again. The remaining two parts of the book; I didn't like that much. Both design patterns and unit testing deserve more attention and you're better of learning about them from dedicated books. Well, for those who will first hear about them here, it might be just enough to make them buy another book on the subject. Nevertheless, the book is definitely worth getting. The author is letting the readers decide for themselves how much they think its worth and set their own price. Since this can be difficult based just on the info on the page, maybe this review can help you set the right price. I certainly don't regret buying the book and I'm looking forward to it being completed. The author seems to be updating it regularly.